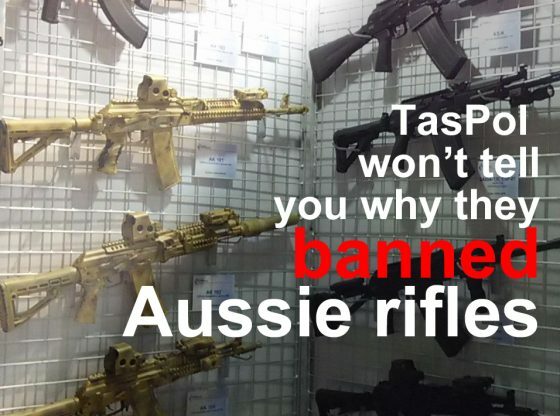 TasPol can’t give reasons, documents about Aussie rifle ban. Can Police Minister help or is he hiding? Home /Featured, National Firearms Agreement 2017, Politics/TasPol can’t give reasons, documents about Aussie rifle ban. Can Police Minister help or is he hiding? TasPol can’t give reasons, documents about WFA-1. Can Police Minister help or is he hiding? Last year we raised with you the concern that Tasmania Police would not offer any written reasons or rationale for the ban of the Australian-made Warwick WFA-1 rifle beyond a one-sentence statement that it duplicated the appearance of an automatic rifle. As you know, the WFA-1 requires a manual cycle of its action in order to load each round. In your reply of last June you refer us to your State’s Right To Information Act process in that we can seek Tasmania Police information, including documents, under that Act. We have done so and the Police, via Commander Keating, have taken the position that no documents exist concerning the proper classification of the WFA-1. They have offered nothing beyond the bare statement that the WFA-1 was prohibited ‘on appearance alone’. Your reply of June offers us more than that because although you say you do not know which firearm the WFA-1 was thought to have duplicated, you at least suggested Colt’s M4 rifle as a possible candidate. over a dozen documents – such an ‘assessment template’ – did in fact exist in relation to the WFA-1 (we attach a couple of ACIC documents just to make the point). You would be aware that, in dealing with a Right To Information request, there is a difference between saying ‘documents exist and we refuse access because those documents are exempt’ and ‘no documents exist’. The Police have curiously chosen to deny that these documents exist, such as Firearms Classification Committee agenda, minutes or working papers. In respect of supposed commercial information, Police claim an exemption without specifying the sort of documents or how many pages worth are exempted. We have of course appealed Commander Keating’s decision to Tasmania’s Ombudsman (in a process that will apparently take years), but none of this should be necessary at all. Seven months on from your reply last June, we are still in a position where unidentified unaccountable bureaucrats have banded together to prohibit licensed, law-abiding members of the public from owning something they would be otherwise perfectly entitled to safely own. We are still in the position that Tasmania Police cannot offer any details written analysis – not even two sentences strung together – to cogently explain what automatic weapon the WFA-1 substantially duplicates or the elements of each of the WFA-1 and the automatic weapon that are said to be similar (or why). Senior bureaucrats of the Island State have seemingly committed to the banana republic method of government administration, where great swathes of the public are affected by arbitrary decisions made in secret for no written reasons. If a member of the public wants the bureaucracy’s documents, then the documents are simply said not to exist. Lastly, and most insultingly, any sort of question as to why this should be the case seems to be met with ‘you can fight the decisions in court’. Setting aside whether ‘appearance laws’ should exist, it might ultimately be the case that the Warwick WFA-1 was (at law) correctly banned on a logical footing. But at this rate we’ll never know. The complete lack of cogent reasons and the complete denial of available documents makes a mockery of the exercise. Will you, as Police Minister, seek answers from your Police Service in relation to the secrecy and rejection of transparency in the WFA-1 process?